Poetry Scores is an unincorporated, unfunded, all-volunteer, international arts collective based in St. Louis that builds community by translating poetry into other languages and media. Poetry Scores will present “Do Not Die: The Poetry of Marine Petrossian,” a multi-media exploration of new work in English translation by a poet from Armenia who will visit St. Louis and Granite City for the events. Musical scores of Marine Petrossian’s poems, performed after she reads each poem, will be presented Friday, May 26 at the Schlafly Tap Room in downtown St. Louis. The night starts at 9 p.m. with National Steel Guitar legend Tom Hall. Poetry Scores goes on at 10 p.m. with Marine reading before local artists scoring her poems for rock music, including: Three Fried Men, Nick Barbieri, Mi Gett, Carl Pandolfi, Robin Allen, Michael Apirion, Sean McGovern, Sherman S. Sherman, Mike Stuvland and Robert Goetz. At 11 p.m. Accelerando will perform its scores of Marine’s poems, and a score by Andrea Perkins of Hawaii, after Marine reads each poem, followed by other songs from Accelerando’s repertoire. This is a free show. The Schlafly Tap Room is a brewery and restaurant that makes its own craft beer and delicious food with a full-service bar. (Schlafly Tap Room: 2100 Locust St., St. Louis 63103; 314-241-2337; www.schlafly.com). Visual scores of Marine’s poems will be presented in an art invitational at Mad Art Gallery in Soulard 7-10 p.m. Saturday, May 27. At least 20 visual artists will make or reposition work in response to one of Marine’s poems and take the poem’s title as title for the art. These works will be for sale, with any proceeds split evenly between artist, gallery and Poetry Scores. Artists confirmed for the invitational include: Gina Alvarez, Adrian Aquilino, Amy Bautz, Michael Behle, Jeff Brawn, Keith Buchholz, Heather Corley, Jon Cournoyer, Gina Dill-Thebeau, Deborah Douglas, Suzy Farren, JoAnn Houle, Chris King, Alicia LaChance, Tim Meehan, Susan Paszkiewicz, Stefene Russell, Lyndsey Scott, Dana Smith, V. Elly Smith, Mark Stephens, Robin Street-Morris, Andrew Torch, Timothy E. Wagner and Eric Woods of Firecracker Press. The art invitational is curated by Gina Alvarez and Chris King. Marine Petrossian will perform her poems 8-8:30 p.m. in the gallery. This is a free show. Mad Art Gallery operates a cash bar. Our host Ron Buechele is likely to translate a Marine poem into a cocktail. Jocko Ferguson will certainly score Marine’s poetry as food, which will be available for a pittance. (Mad Art Gallery: 2727 South 12th, St. Louis 63118; 314- 771-8230; www.madart.com). On Sunday, May 28, Marine will perform her poetry following Sunday service at St. Gregory the Illuminator Apostolic Church in Granite City, which starts at 9:30 a.m. Service usually ends between 11:30 a.m. and noon, at which time there will be refreshments at the hall with the poetry performance. (St. Gregory: 1014 W Pontoon Rd., Granite City, Illinois 62040; 618-451-7884; http://www.stgregorychurch.net/). Marine Petrossian is an Armenian poet and essayist whose writings and TV appearances made her a public figure. She lives in Yerevan, Armenia. The start of her literary career coincided with the end of the Soviet Union. 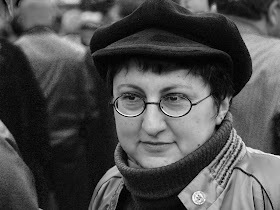 Her first book was published in Yerevan in 1993, just two years after Armenia, formerly a Soviet republic, became independent. Since then, she has published another four volumes of poetry in Armenia. Her work has been translated into French and published in France, and translated into Spanish and published in Argentina. She self-translates her poetry into English (recently, in collaboration with Arthur Kayzakian) and this work has been published in Transcript, Europe's online review of international writing, as well as in Deviation, Anthology of Contemporary Armenian Literature. She has been a writer in residence in California, New York and Vienna. This is her first visit to St. Louis, though in 2016 scores of her poems were performed in St. Louis in “Grandchildren of Genocide,” Poetry Scores’ recognition of the centennial of the attempted Armenian genocide in Turkey. For more information: Chris King, brodog@hotmail.com. Poetry Scores' original blog, dating back to 2008, is at http://poetryscores.blogspot.com/. Since Google bought this platform, we have been unable to use that blog or get any customer service from Google.